Hue and Lifx bulbs have been supported with Amazon’s Echo/Alexa ecosystem for a long time. One of the missing elements, the ability to specify specific colors or temperatures, was missing, although cool third party integration with Yonomi allowed you to create routines to handle specifying colors. 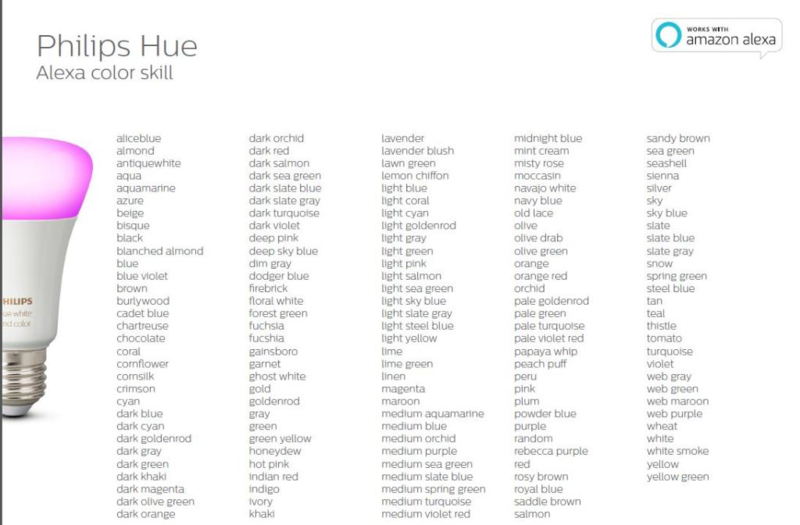 While Hue has been supported natively for a long time, to turn on the new functionality, go to the Alexa app or web page, search for “Hue” and enable the skill. When you’ve configured and tested your new or edited Activities, next step is to add a Thing to SmartThings. This, too, isn’t intuitive. Select the + on the Things screen on your phone, then Entertainment, Buttons/remotes. Select Logitech. Your already configured Harmony Hub will appear. Select it, watch the spinning cursor as it refreshes and pulls down your revised, increased list of Harmony Activities. Then select additional activities, watch the cursor spin and the app will populate with the revised list of activities. Smart Things insists on adding [Harmony Remote] to the end of activities imported from Harmony; you’ll need to edit them to at least remove the [Harmony Remote]. To edit, tap the activity to open its page and then the gear wheel to edit the name. Here’s where the name game becomes interesting. I’ll come back to this when I’m done explaining the process to get all of this hooked up to Alexa for voice control. 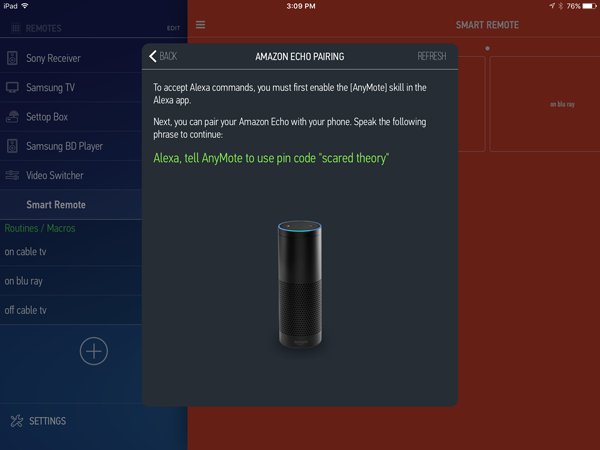 The final step is to access the Smart Home tab in the Alexa Echo app. If you have the SmartThings skill enabled, you will need to disable it and then enable it so that it can re-read the list of “Things”. Then you’ll need to re-run Discovery (a pop-up should automatically appear to action this). All of your new activities should now show in the Your Devices list. And you’ll need to do this each and every time you edit or add a “Thing”. There’s a big gotcha to be aware of. You can’t use the Station name/Playlist Name in your Sonos Favorites. You can’t use any Artist name or recognizable Playlist Name because Alexa will ignore the SmartThings skill and play music natively on Echo/Dot. Here’s how I learned what works and what doesn’t. 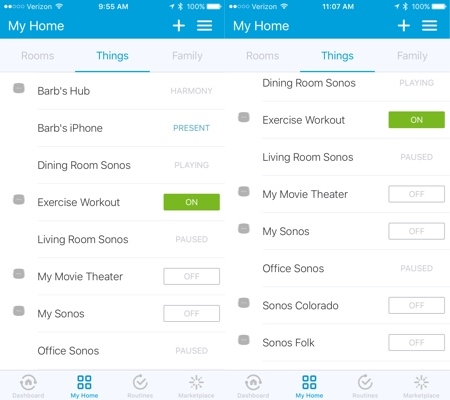 I discovered that when I selected an Amazon Playlist named ABBA (or even the Pandora ABBA Station) from Favorites for the channel to play from Sonos on the Harmony Activity named Sonos Music and linked it with SmartThings and enabled Alexa that every single time Alexa played something else named Sonos on the current Sonos speaker (or already grouped speakers). And completely ignored the SmartThings list. When I renamed the “Thing” to My Sonos in SmartThings and removed/re-added the skill in the Alexa App, I had better luck, but only some of the time. I similarly had problems with a John Denver and a Judy Collins playlist in Favorites. Alexa consistently ignored the SmartThings skill and played music by (whomever) on the Echo or DOT. .
After the above limitations sunk in, I decided to try a task based name, Exercise Workout. I set that up and was able to use ANY Sonos favorite without confusing Alexa. 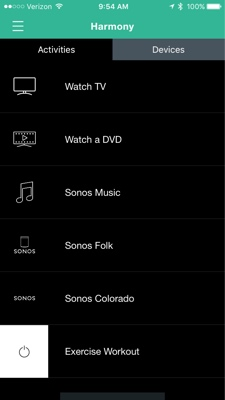 So in SmartThings, I currently have Sonos Colorado for John Denver and Sonos Folk for Judy Collins (these work). I’ll have to come up with better, memorable names that are task based. So now I’m going to finish the task of renaming activities on the Harmony and in SmartThings to get this Harmony-Sonos-SmartThings-Alexa setup to work 100% of the time. Probably using task based and/or some other convention that Alexa won’t recognize. If you have any ideas, let me know on Twitter @barbbowman. And I hope that the same situation isn’t true with the coming “native” Alexa support for the Logi Harmony Ultimate. Heaven forbid that I should have to lift a handheld remote in my very Smart Home. I got to thinking that with everything I’ve voice enabled here, I had not done anything with my home theater equipment. I’ve got a bunch of stuff downstairs in the Living Room and a bunch of stuff in the Master Bedroom. 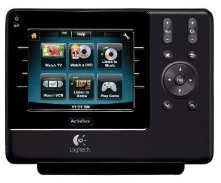 I’ve already got a Harmony Ultimate Hub/Remote in the Bedroom and an old and dying Harmony 1100 in the Living Room that I’m replacing with AnyMote Home. I decided it was time to experiment with Alexa voice control. The TLDR; version of this post is that AnyMote, which takes concentration and time to set up (and is pretty geeky when it comes to advanced functions), coupled with the Alexa AnyMote skill is awesome. In my Living Room, my goal was to replace the dying Harmony 1100. I thought about getting another Harmony Hub for the Living Room to use with my iPad Air, but was concerned that when I got to voice enabling it that there would be conflicts with the Bedroom Harmony Hub (see below on the Master Bedroom) AND I’m not very fond of the individual device control interface for Harmony on the iPad. 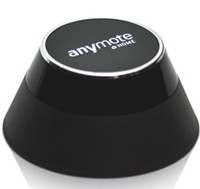 And Amazon had the AnyMote Home on sale for $89.00. Plus, AnyMote allows Alexa voice control of individual “buttons” (which is not the case with using the Harmony routines) as well as macros (activities). AnyMote is an amazing tool. It’s a geek treasure hunt (like peeling back layers of an onion) that leads to discovery of the many things this little gadget can do when coupled with a supported device and I’ve barely scratched the surface. I used my iPad Air to set things up (and will also be using my iPhone) as I wanted the larger screen for first time set up. I pretty much found built in codes for most of my (aging) home theater components; I had to use the record a button feature to get a few things to work properly, but I got the basic functions working and tested fairly quickly. After insuring the remotes were configured correctly and buttons were working properly, I jumped in and created macros that turned on three devices and set the proper inputs, etc. I started with 4 so that I could control my set top box and my BD ROM player; one each to turn everything on and one each to turn everything off. I used longish delays between powering on and off components so that I could properly test (see image below) and have been adjusting the delays as I go. Below is one of the macro in progress where I can stack commands and delays. 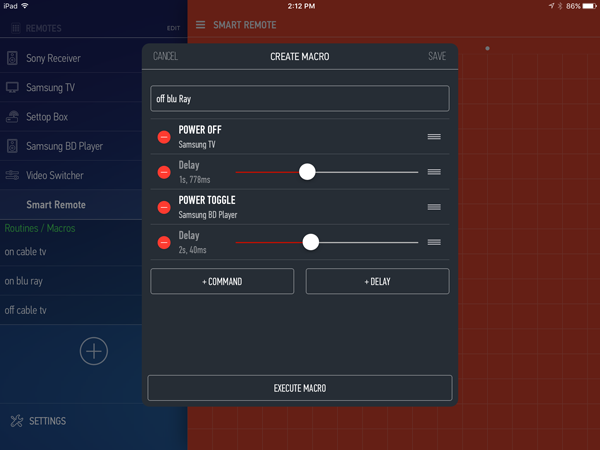 I created a blank Smart Home Remote and named it Home Theater and imported the 4 macros. I was itching to try the Alexa AnyMote Skill, so I stopped there and got that up and running. Pairing with Alexa is built in to the AnyMote App; a phrase is displayed that you speak, and Alexa complies and acknowledges. After pairing is complete, the AnyMote App displays an abbreviated tutorial (which didn’t cover everything I needed, but there is more information on the AnyMote Knowledge Base which answered most of my questions. Basically, you tell Alexa the name of the button to action and the device remote to use, e.g., “Alexa, tell AnyMote to MUTE my Sony Receiver”. For macros, the syntax is “Alexa, ask AnyMote to execute [macro_name]”. One of the gotchas’s is that every time you create new macros, apparently you need to disable the AnyMote Alexa Skill in the Echo App, repair your AnyMote with Alexa (which resynchronizes everything). It isn’t a big deal, but it is annoying. Editing the visuals of a remote is also available. 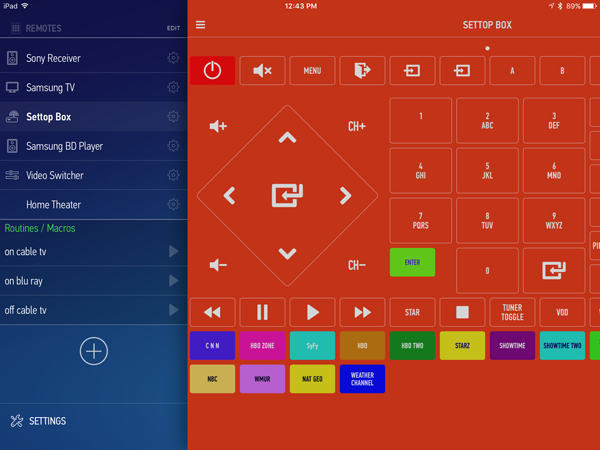 Inside the remote editor, I can change themes, button colors and text and use built in icons. I couldn’t get the channel icons for the United States to appear/work, so I settled for color coding the channels that I created macros for. I’m probably missing something obvious, but for now I can tell Alexa “Ask AnyMote to execute HBO” and the channel changes. Or I can push the buttons on the iPad. I saw some negative comments about AnyMote, but I highly recommend this device and app if you’re comfortable with doing tweaking and fine tuning to get things “just right”. I have a SmartThings Hub that I was not using (I’d bought it in my quest to voice enable my Sonos speakers, but it didn’t meet my expectations so I went elsewhere to fill that need). I remembered that SmartThings was supposed to work with Logitech Harmony Wi-Fi based remotes, so with nothing to lose, my first task was to see what I could accomplish with my bedroom home theater gear. 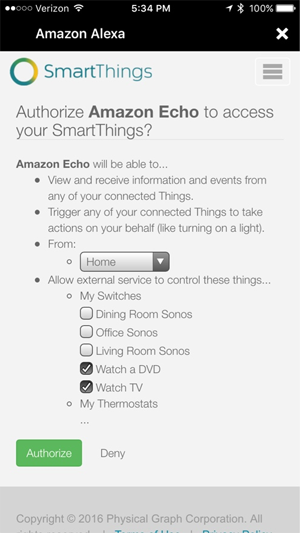 SmartThings requires a whole series of steps, done in a particular order, to add “things” and authorize for use with Alexa (I’d previously disabled SmartThings in the Alexa App after the Sonos experiment.) 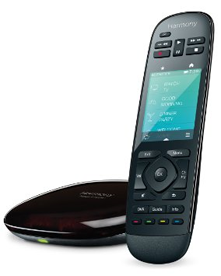 Harmony remotes use “Activity” based commands (macros) and it looked like that these activities could be voice enabled (but not individual control of devices, like Play, Pause, Stop, Eject, etc. for an individual component). The process for me was a little rocky. SmartThings discovered my activities after I linked with my Harmony account and imported them as “Watch TV [Harmony Control]”, “Watch a DVD [Harmony Control]”, etc., so I had to rename them (deleted the [Harmony Control] part) and then relink SmartThings with Alexa. Fortunately, the Alexa App is very smart and lets you pick which SmartThings devices to control. I ran Discovery in the Alexa App and the two “activities” were discovered and added. However, Alexa just didn’t seem to understand the “Watch a DVD” or “Watch TV” syntax. I tried speaking slowly, quickly, but Alexa kept offering to play songs from my Music Library or other responses. After a while I decided that maybe renaming the activities was the solution. So I renamed to “My Movie Theater” and “Xfinity”. 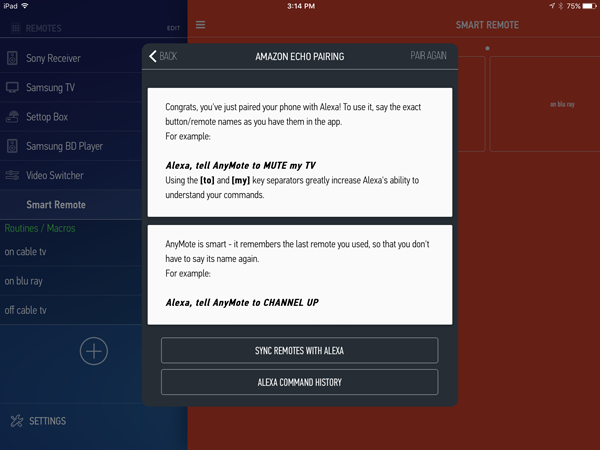 I then disabled SmartThings in the Alexa App and unlinked SmartThings and relinked, etc. but couldn’t get Discovery to find the new named activities. 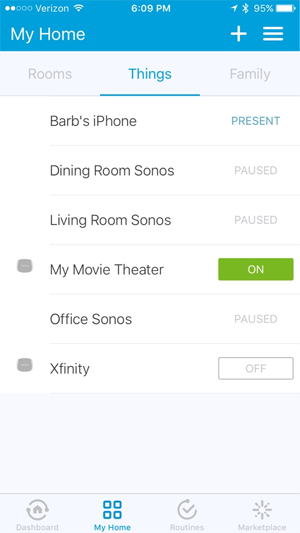 I had to unlink/remove AND remove the Harmony Remote from SmartThings and re-run discovery for Things, rename to My Movie Theater and Xfinity, relink to Alexa and THEN run discovery to get the selected activity/Things to appear. Eureka. This works. When I tell Alexa (via my upstairs Dot) to “Turn on My Movie Theater”, all the right things happen. The components are properly powered on and the handheld Harmony remote actually changes to reflect the running Activity so that I can use the buttons to Play, Pause, FFW, etc. I wish I could tell Alexa to “Play”, “Pause”, etc. and maybe someday I WILL be able to do this. I wasn’t too enthralled by the SmartThings setup process. I know Yonomi also can link to Harmony, but I wanted to first try my neglected SmartThings Hub. I’m sure Yonomi will be smoother, but again, only the Activities (macros) will be supported. For me, AnyMote is the clear winner in Home Theater control. I’m using maybe 25% of its capabilities and as time goes on, I’ll be experimenting with other functionality. I love my Alexa enabled Connected Home and I love the Yonomi App. 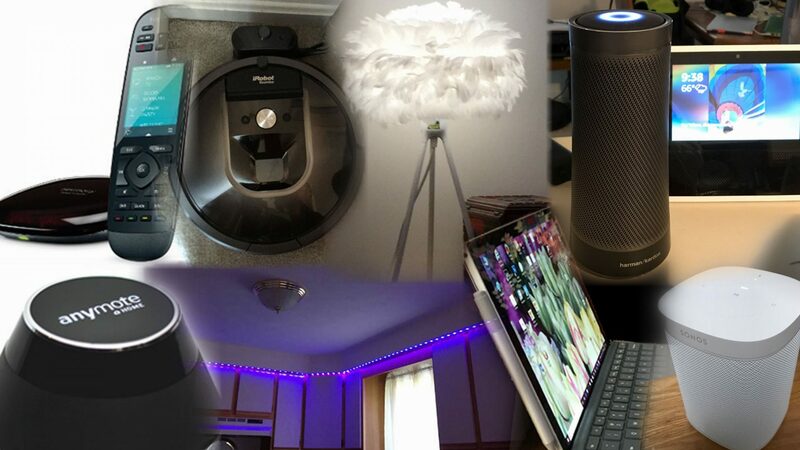 Amazon’s Echo Smart Home covers an amazing number of products and gets better all the time. One of the missing ingredients for my needs was the ability to change the colors on my Hue bulbs and Lightstrips. Alexa handles turning these on and off and dimming the bulbs, but color changes are not currently in her repertoire. IFTTT can handle single bulbs and Lightstrips and can change colors on a single light or Lightstrip or can change ALL of them at once, but not “scenes” or “routines” (two Lightstrips, or two Blooms, etc. ); it’s all lights or just one of them. Once again, Yonomi comes to the rescue, and Alexa can now color my world and set my Hue devices to predefined (or even random) colors. Most of my Hue gear is configured in pairs or threesomes. I don’t ever seem to turn on all my Hue lights (which are spread over the three floors of my Condo). It’s almost always one room at a time, and every so often, one floor at a time. 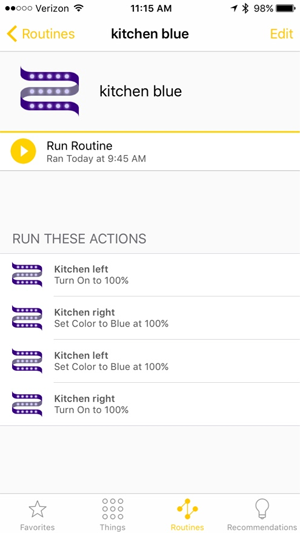 Apple’s Siri, with scenes, allows me to tell Siri to turn on Kitchen Blue or Kitchen Yellow, but Alexa doesn’t support colors for Hue and IFTTT doesn’t support scenes or routines. Alexa is far more dependable than Siri (like 99.9%) and I was able to solve this last piece of my Connected Home with Yonomi. 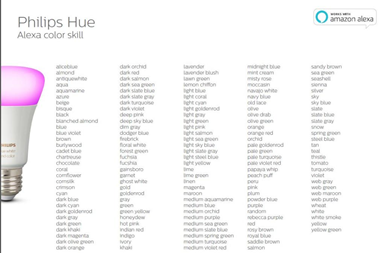 First, inside the Yonomi App, I linked to my Hue Bridge. Then, I created two (for starters) Yonomi routines. I created Kitchen Blue and Kitchen Yellow. I turn each of the two Lightstrips on to 100% using Actions and set the color to Blue (or Yellow). There are lots of other options, including dimming, fading, random colors, but these are the two I wanted to start with. Once these were done, I open the Echo web app and ran discovery so that these two new routines were discovered and added to my device list. Now I can tell Alexa to “turn on Kitchen Blue” or “turn on Kitchen Yellow”. It takes a few seconds, but the lights cooperate. I can turn off by telling Alexa to “turn off the Kitchen” as this command IS covered using Alexa groups natively. 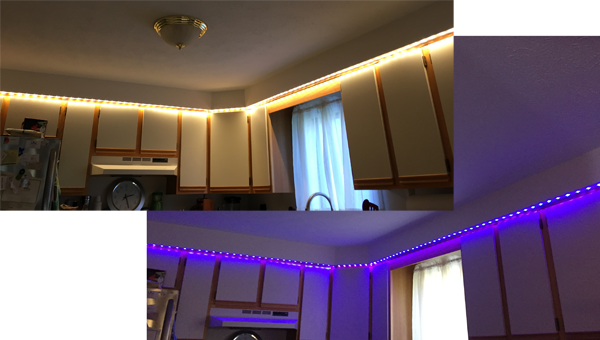 So, I find myself saying thank you again to the folks at Yonomi App for giving me the ability to fully control my Hue colored bulbs and Lightstrips. I recently discovered the Yonomi App which was the result of a narrow quest to enable voice control for my Sonos stations using Alexa. The Connected Home landscape is still filled with detours and roadblocks, but Amazon’s Alexa (Echo) is what Siri should have been and there is support for far more devices and vendors on the Alexa platform. With the Alexa Skills for developers, the platform is open and growing. The best of the bunch of existing Alexa Skills is Yonomi. That was my opinion even before the nice folks at Yonomi sent me a LifX 1000 color bulb and a Vita Copenhagen EOS mini feather lamp to add to my connected home. I’ve got some Hue bulbs, lightstrips and Hue Blooms, and I was already enamored of what color does in my home. To me, it is “internal landscaping with light”, but also very functional. Unlike Hue, which needs a hub, LifX is Wi-Fi (and cloud) based. LifX app setup is a little quirky as you need to go and reset your password as no password is configured at all when you set up your light(s), which I see as a huge flaw. Most consumers won’t figure this out as resetting a non-existent password isn’t exactly logicial. 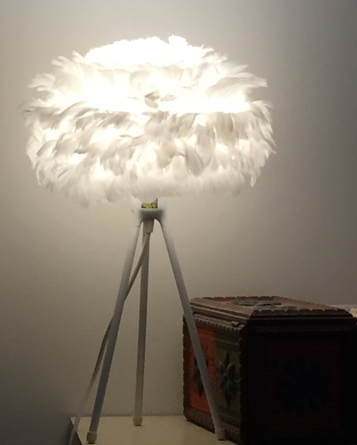 But, all in all, my LifX color bulb nestled in my new feather lamp in the guest bedroom is a nice addition to my connected home. LifX has a nice iOS app, an Android app (that I have no experience with) and wonder of wonders, a Windows App. 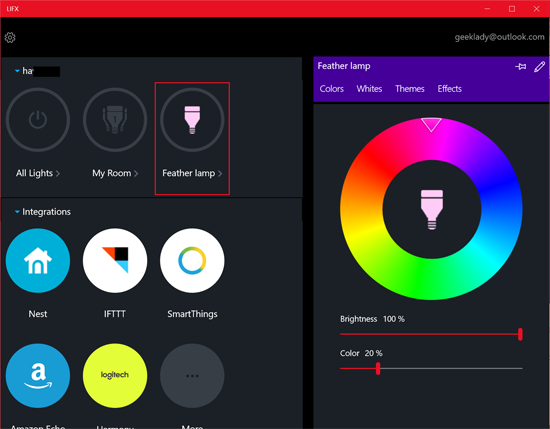 LifX is possibly alone in official support of the Windows Platform. Insteon made an initial attempt to support the platform, but has seemingly abandoned it, as their Windows App broke around October 2015 and has not been fixed, nor has it been updated with the new functionality available to iOS and Android. Hue has done nothing for Windows users and their iOS app is not very robust. Lutron has done nothing for Windows users. So a shoutout to LifX for being an equal opportunity developer. I’ve recently added an Echo Dot to my connected home and it resides on my nightstand connected to my first generation Bose Wave/PC radio. Alexa can hear me in the Master Bedroom, the Guestroom. and my Home Office in the Loft above the bedroom. Perfect. 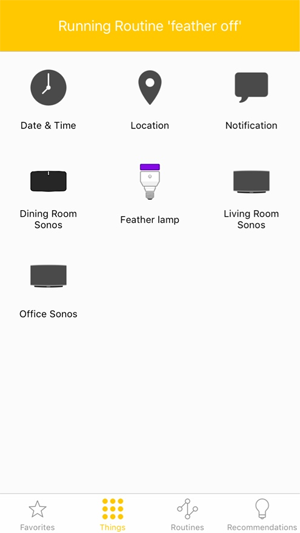 Running Smarthome discovery again in the Echo app got my new Feather Lamp discovered immediately. Alexa controls this beautifully including dimming and color changes. 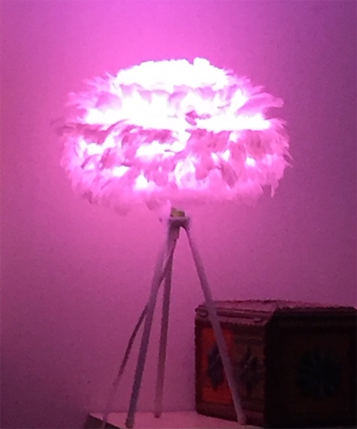 The official commands are listed at http://www.lifx.com/pages/alexa – and I customized what I need for my new Feather lamp. Yonomi allows you to create both time and geofencing based “routines” (many vendors call these scenes). 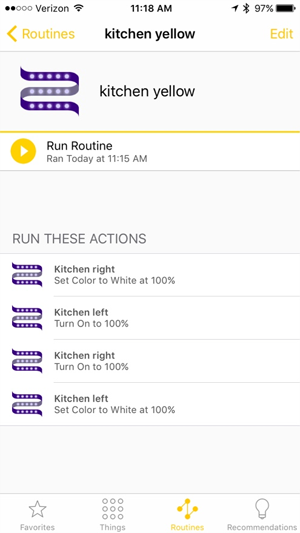 You can create these and use them from the Yonomi App AND run device discovery in the Amazon Echo app to allow voice control via Alexa for these same routines. At the simplest level, you can create a routine without a time or location dependency by configuring (or leaving on the default setting) Date & Time without any parameters. Then add your action items for your device(s). I created two routines. Feather on and Feather off (shown below). I’ll be adding my Hue gear to the Yonomi authorized list soon and create some more complex “routines” involving turning on lights and Sonos music. Once I complete this, I’ll ask Alexa to run the routine. More information is available from Yonomi on this type of usage. My personal style is to set up what I need in the Yonomi App and use Alexa voice control for on demand connected home actions/routines. The location based (geofencing) routines just work automatically, as do the time based routines. 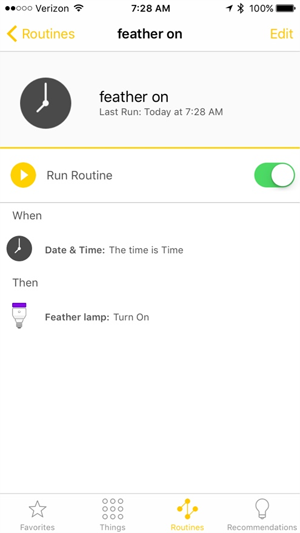 So once configured, while I could run routines from the Yonomi app, I prefer voice control. I suspect that when my list of routines gets big, I’ll need to depend more on the app to remind me what I’ve configured, but over time, I intend to use voice control whenever possible.